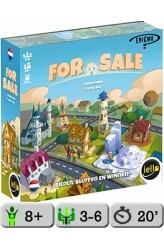 For Sale is a quick, fun game nominally about buying and selling real estate. During the game's two distinct phases, players first bid for several buildings then, after all buildings have been bought, sell the buildings for the greatest profit possible. https://youtu.be/4AEuhnoQ96U .. Welcome to Santiago, the second largest city in Cuba, home of legendary rum and birthplace of the revolution! The chaotic streets hum with the sounds of bustling crowds and busy commerce. Cargo ships constantly arrive and depart from the port. Demand is continuous, if unpredictable, for a supply of local products such as exotic fruits, sugar, rum, tobacco, and cigars. In Santiago de Cuba, your business card says "broker", but in reality you're a shady wheeler-dealer who arranges deals with the locals and with corruptible officials to move goods and meet the demand of those ever-present cargo ships – and your ability to procure these goods is only as reliable as your "connections". 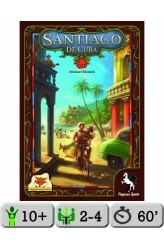 At the start of the game, nine locals – the Cubans – are randomly arranged on a path around Santiago, with ..